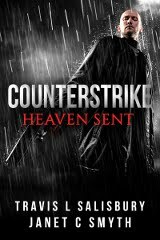 Visit counterstrike-heaven-sent-book.com for contact details, book photos, and author bio. Travis L Salisbury, Author of Counterstrike: Heaven Sent, an epic spy thriller/romance novel, has spent the past year, editing and perfecting his late mother, Janet C Smyth's story, in the face of her tragic loss from Ovarian Cancer in December of 2014, fulfilling the promise he made to his mother on her deathbed, to execute her story. Included with the novel is the Author's biography and documentary chronicling the events surrounding his mother, the original Author's illness and death, and his personal struggles in self-publishing. Author will pledge 10% of all current and future book proceeds to a Cancer and Malpractice charity. 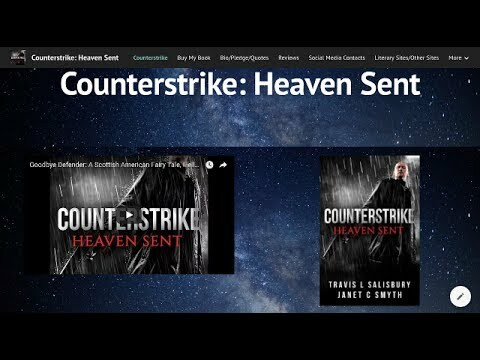 For people who love books, or are thinking of writing, the story behind the production of Counterstrike: Heaven Sent should provide a good inspirational and motivational read. “What's happening is not what I expected to be doing with my life.” - Kate Greenwood, from chapter 11 of Counterstrike: Heaven Sent. Born Eugene, OR, Feb 7, 1980. Parents Jeffrey Salisbury and Janet Smyth (d. 2014) Divorced 1982. Grew up as a poor kid in Coos Bay, OR. Two years community college. Had previous employment as a caretaker for Grandfather Norman and Mother Janet, for 14 years, thought I'd give a stab at copy editing.